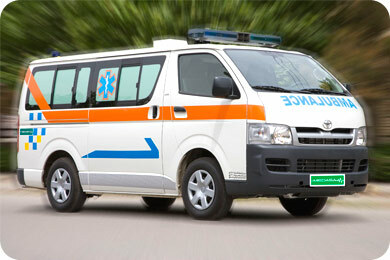 With twenty Years of experience and knowledge in the ever increasing demands for efficient and modern Medical Equipment, Ambulances and Emergency Medical Services (E.M.S) in the Middle-East region, the Management of Paramed International Co. has proceeded to register the said company as a Manufacturing and Commercial company in the Jebel Ali Free Zone, U.A.E. The Management’s desision was taken to make optimum use of the exeptional opportunities available in this developed zone, in order to better serve our customers and fullfill our organizational commitments to enhance the standards of general Healthcare and provide better emergency cares in unforeseen events and for accident victims. The main objective of the Management Team and Personnel of Paramed International Co. is to achieve maximum customer satisfaction by providing quality services and products. Standard equipment: Main stretcher, Central oxygen system, Portable suction unit, Emergency and Resuscitation case, Wall mounted sphygmomanometer, I.V Hook, Portable O2 cylinder. Optional equipment: Defibrillator, Ventilator, Pulse Oximeter, Syringe pump and infusion pump, Long Back board, Scoop stretcher, Chair stretcher, Pole Stretcher, Central Suction system with vacuum outlet and one liter Jar, AC/DC power supply with 12 Volts in to 220 Volts invertor with 220 Volts outlet, Extra battery, Battery charger and inlet installed on the body with connectind cable, Cold Box, Hand sink.